As I mentioned in my previous post I’m Engaged, Now what? finding the right venue should be one of the first things on your to do list. Almost everything you do will depend on the venue. 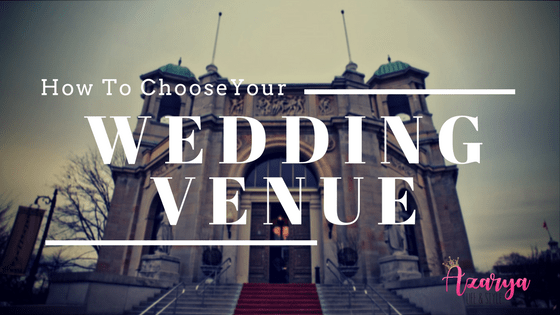 The venue will also be your single biggest expense, so it is crucial that you make the right decision when it comes to this. No stress.. I am here to share with you some of the tips that I have acquired through my extensive *cough* research and experience. Before you even do a google search to find out what venues there are in your area, the first thing to do is determine the number of guests you are having. This must be established before you can even start venue shopping. How many people are you planning on having at your wedding? This is the easiest way to eliminate multiple venues if you are planning a large wedding (250 or more guests) as many locations will have a maximum capacity. * Tip- When they tell you their maximum capacity find out whether this is for a banquet floorplan (chairs and tables). Also ask if these floor plans include a dancefloor. You would be surprise by how may venues advertise that they can accomodate 800+ only to find out that for this many people to fit in, you would have to get rid of the dance floor and all remove tables and chairs… yeahh basically everyone would be standing. This is alright if thats what you are going for. It is reasonable to allocate 40-60% of your overall budget on the venue (see my previous post). Knowing your budget is important again because it will allow you to rule out venues that are too expensive. With the first 2 things in mind, it is reasonable to get on google to start shopping for your venue. I would advise you to stay organized by creating a spreadsheet detailing all your options. *sidenote* Spreadsheets are the single greatest creation when it comes to wedding planning and organization. Once you have these basics, you can now start to schedule visits. It is during these visits that you will be able to ask questions that will help you narrow down your list. Keep in mind that there may be NO venue that has ALL the things on your list. You have to determine your priorities ahead of time and look for the venues that you will be happy with. I couldnt be more pleased with the venue that we chose for our upcoming wedding. Check out this vlog to join us on one of our visits to our Venue- The Liberty Grand in Toronto!